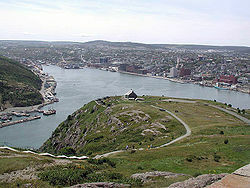 The Battle of Signal Hill (September 15, 1762) was a small skirmish, the last of the North American theatre of the Seven Years' War. The British under Lieutenant Colonel William Amherst forced the French to surrender St. John's, which they had seized earlier that year in a surprise attack. Most of the fighting between France and Britain in continental North America ended in 1760. The notable exception was a French attempt to gain a bargaining chip for peace talks in 1762, when Choiseul sent a small fleet that gained control of Saint John's, Newfoundland in June of that year. When General Amherst heard of this surprise action, he immediately dispatched troops under his nephew William Amherst, who regained control of Newfoundland in the Battle of Signal Hill in September.